Your pooch loves you! No doubt in it! You too love him! Indeed! But, have you ever thought of depicting your love through delish food? It does not matter what your answer would be. The great thing that comes into the spotlight is, you have to give a dose of love to your furry friend. Now, you might be wondering what to make for him. Worry not! Here we have jotted down a unique recipe that will surely lend you a hand. Here you go! 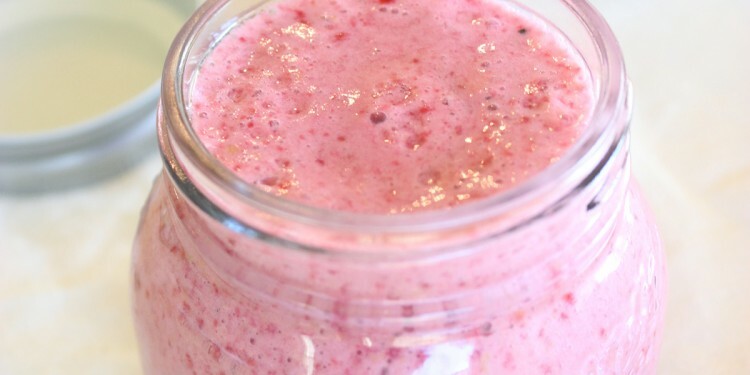 This luscious Raspberry Goat Milk Dog Smoothie Recipe guarantees to make your pup go crazy! It is extremely easy, simple and healthy recipe and you will love to make it every month for your adored pooch. This nutritious recipe creates a non-green smoothie, which is utterly succulent. Packed with incredible taste, tempting color, it is one of the amazing recipes that entice not only animals but human beings too. The best part is to make it, which is pretty simple. You only need three ingredients, a blender and you are ready to make this palatable smoothie recipe within minutes. This smoothie will be ideal for 4-5 servings, and you can store put it into a sealed container and refrigerate it or freeze them in ice cube trays and serve them as summer treats! Firstly combine goat milk or powdered goat milk, frozen strawberries and peanut butter (without added sugar or salt) in a blender. Not blend them well until smooth. You are done! Just serve them. Store the remaining smoothie in an airtight container in the fridge for up to 3 days.